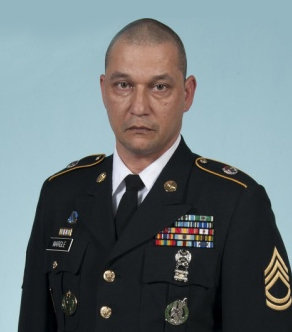 SFC Christopher Margle joined the United States Army Reserves in 2002 as a 92F Petroleum Supply Specialist. He completed Basic Training at Fort Jackson, SC upon completion of Basic he went to Fort Lee, VA where he was awarded the Military Occupational Specialty of Petroleum Supply Specialist. His duty assignments were with the 381st QM BN in Evansville, IN. He then transferred to the 95th Division (IT) as a Drill Sergeant in Owensboro, KY. He was then called to Active Duty for two years as a Drill Sergeant at Fort Knox, KY. He also deployed to Afghanistan in support of Operation Enduring Freedom. He then became Active Guard Reserve Soldier and was assigned to the Wellsboro Recruiting Center in the Harrisburg Recruiting BN. His awards and decorations include the Afghanistan Campaign medal w/ Campaign Star, Joint Service Commendation Medal (2), Joint Service Achievement Medal, Army Achievement Medal, Army Reserve Component Achievement Medal (4), National Defense service Medal, Global War On Terrorism Service Medal, Non Commissioned Officer Professional Development Ribbon (2), Army Service Ribbon, Overseas Service Ribbon, Armed Forces Reserve Medal w/ M Device, NATO Medal, Drill Sergeant and Recruiter Badges.